We don’t have a dog and most of the time those leftovers are for me. With the size of many restaurant portions these days, it’s only wise to bring part of your food home for another meal… or possibly two. Whether you’re really taking the food home for the dog or yourself, it’s also important to keep it safe. That’s where the “two hour rule” comes in. Perishable food left at room temperature for more than two hours may become unsafe to eat. Remember, it becomes the “one hour rule” when temperatures are hotter than 90 degrees outside. Think about how hot the inside of a car can get. Bacteria grow very quickly at these temperatures. If you’re planning on a movie or a little shopping after dinner, then it’s not safe to leave the food to sit in the car for that extra time. Bring a cooler with ice if you know you’re probably going to get a doggy bag… that’s a good thought whether you’re going straight home or not. 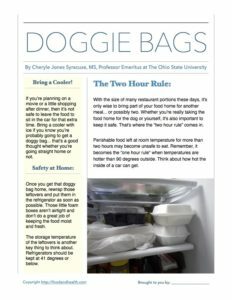 Once you get that doggy bag safely home, think about rewrapping those leftovers and putting them in the refrigerator as soon as possible. Those little foam boxes aren’t airtight and don’t do a great job of keeping the food moist and fresh. The storage temperature of the leftovers is another key thing to think about. Refrigerators should be kept at 41 degrees or below. 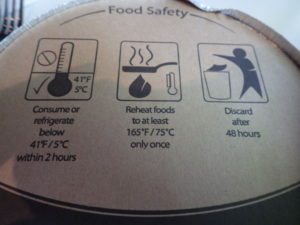 I was recently impressed when my container of restaurant leftovers came with food safety instructions. I think this was smart of them, wanting to keep their customers safe. This container was also sealed a little tigher than most. As well as not spilling in the car on the way home, it helped to keep odors from other foods in the refrigerator from co-mingling with my leftover pasta. Their instructions for keeping the food safe were even a little more strict than I usually go by. But, less can be better in this instance. Refrigerated food doesn’t keep forever. 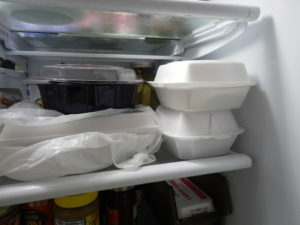 If you dine out a lot, then those little containers tend to multiply uneaten in the refrigerator. The best recommendation is to plan on eating those leftovers within three to four days of bringing them home. Remember that you can’t always see, taste, or smell the bacteria in food that may make you sick. For safety’s sake, leftover food should be heated thoroughly before eating. This means to heat it to 165 degrees F. The only way to make sure you’re doing that is to use a food thermometer. When heating in a microwave, stir during cooking and allow some standing time for the temperatures to unify. While it may seem wasteful, keep in mind the old saying: “when in doubt… throw it out!” Wasting a little food is not worth the risk of a foodborne illness. If you can’t keep the food safe, then you may as well leave it in the restaurant in the first place. Provided that you keep your doggy bag food safe, you can save some serious calories by cutting your restaurant entree in half. The Lasagna Classico at Olive Garden weighs in at 930 calories per plate, with 470 of those calories coming from fat. If you split the meal and saved half for a different day, storing the rest in a doggie bag for later, then you would only consume 465 calories in the restaurant, which is a much more reasonable portion than the original. The Ultimate Bacon Burger at Chili’s is another contender for the doggie bag approach. If you split the burger in half and save half for another meal, you’ll save 515 calories! Now if you ate the whole thing, the grand total for this meal (without fries!) would be 1030 calories. Do you see how a doggie bag can make a huge difference in portion control? An All-American Slam breakfast at Denny’s has 990 calories per plate. If you only ate half, you’d bring the portion size down to a much more reasonable 495 calories. If you were to make all 3 of these changes, you would save 1,475 calories over the course of those meals! Plus, by putting the rest of a given meal in a doggy bag and following food-safe methods, you will have a whole other meal at your disposal. This in turn makes your restaurant choices stretch farther on a budget. And here’s a doggy bag safety handout, just for you!